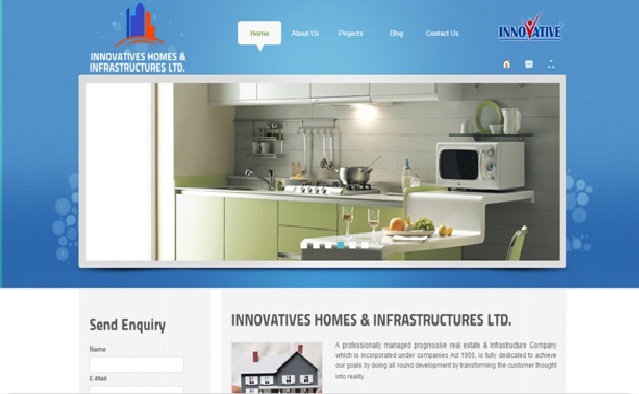 Innovatives Homes and Infrastructures Ltd is a leading real estate company situated at the temple city Bhubaneswar, Odisha. This company is managed by the young and dynamic professionals to deliver affordable lands / property to their valuable customers in the extreme locations of the city. This company is started in the year 2008 processed into the field of real estate, agriculture, co-operative society, food and beverages, fund management and pratibha trust. This company is committed to provide the best services to their customers with 24x7 hrs customer support. This company is a ISO certified company and running the KIDZEE Play School at Khandagiri, Bhubaneswar and also permanently active in social works. This project is a mega housing project at Turanga, Angul, Odisha. This project offers 148 units of 2BHK and 3BHK flats with 1000 to 1200 sqft area. This project provides all the modern amenities and suitable for common man budget. This project is a distance of 2 kms from railway station, 3 kms from bus stand, 2.5 kms from Nalco, 2 kms from Caltex squre, 4 kms from Government hospital, 2 kms from Post office, 4 kms from Police station and 500 metres from Ambani English Medium School. This project is located at Near navodaya school, Gurujang, Khurda. This project provides pollution free environment, well connected with the prime location of the city. This project is a distance of 2 kms from Indo Tebetan Police campus, 2 kms from Khurda hospital, and 2 kms from Khurda town. This project is the 100% percent litigation free land with immediate registration and possession facilities, 30 ft revenue road and 20 ft wide inner roads, all modern facilites like Children’s park, Plantation, Quality electrification, and Community hall with A/C facility. This project is located at Durgapur Mouza, Near GITA Engineering College, Bhubaneswar, Odisha. This project is well connected to the prime locations of the city and a distance of 13 kms from Baramunda bus stand, 5 kms from NH-5, and 7 kms from Jaydev Vihar. This project provides 100% litigation free land with immediate registration and possession, valid documents with all modern International facilities like Plantation, ATM, 24 hrs Water supply, Lift and Generator facilities, Children’s park, Play School and Community hall. hi , thanks for sharing and very good collection.